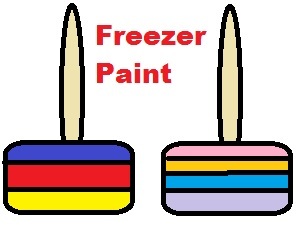 Fill the ice cube trays by layering the tempera paint right on top of each other with different colors. Or you can use flavored koolaid if you don't want to mess with the paint. Cover with a plastic wrap and put slits in the tops to put a popsicle stick down in it. Or you can pull the ice cube tray out when its about half froze and stick them in. Let the kids color with their freezer paint on a large piece of paper.